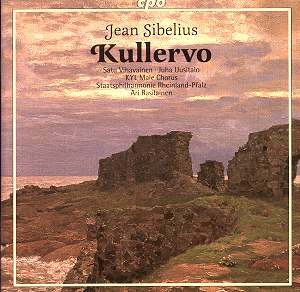 Sibelius conducted the premiere of the Kullervo symphony in April 1892. It was a sensational success appearing in a year not noted for major coups. While 1893 yielded up the last symphonies of Dvoř�k and Tchaikovsky there was little of such emotional and musical magnitude in 1892. Despite this, for most of his life, Sibelius deliberately suppressed Kullervo in much the same way that Sorabji banned performance of his works. Here however the reason had nothing to do with inadequate performance. The Finnish composer had moved rapidly onwards in style and did not wish to be portrayed as dependent on nationalistic sentiment. Kullervo is certainly a work with a strong nationalist signature although I would be hard put to define it. His style rapidly moved from grandiloquence to concision and economy but not before it had tracked through En Saga and the first two symphonies. The lavish expansiveness of Kullervo with its Brucknerian reach and excursions into quasi-Puccinian drama and Tchaikovskian romance represented a road undeniably travelled but which was behind him now. In some enigmatic way he perhaps feared the pull of Kullervo � an obstruction to what he had to say in the period 1904-1924. The wonder is that it survived the destruction meted out to the Eighth Symphony. Whatever the reason, until 1971 only the fortunate few among music-lovers had heard Kullervo. This was the year when the newly-appointed Finnish conductor Paavo Berglund directed performances and a recording of the work with the Bournemouth Symphony Orchestra. It was issued on 2 EMI LPs in the set SLS807. The box was graced with a stunning cover reproducing a Kalevala painting by Akseli Gallen-Kalela. That set held the field unchallenged until the CD era during which a host of versions appeared including a Helsinki Philharmonic Orchestra/Berglund remake for EMI in 1985. Other conductors whose recordings have been issued in that time are Panula, Salonen, Segerstam, Järvi (both Neeme and Paavo), Vänskä, two versions from Colin Davis, Saraste, Spano and this one from Ari Rasilainen. Rasilainen stands at the opposite pole from Colin Davis whose RGA-BMG recording ran to in excess of eighty minutes but whose more recent LSO Live version came to 72:12. The young Finnish conductor is closer in time to the second Colin Davis version and to Robert Spano�s recent Telarc recording with the Atlanta Symphony. The Rasilainen is full of vitality and his excellent male voice choir sounds amongst the largest of all the various recorded versions. It has thunderous impact. There is precisely coordinated enunciation to relish and the joyously etched sound of the Finnish language is a delight. The eerie effects of trembling strings and darkly moaning brass at the start of Kullervo�s Death register superbly. However this is a rapaciously competitive field and there is something excessively velvety about the Pfalzbau, Ludwigshafen acoustic that makes the sound unduly warm and opaque in the loudest massed passages. This prevents a full recommendation. It�s a pity as this is a no-holds-barred performance immersed in the liquor of late romanticism. I compared this with the superb sound secured by CPO for Julius Röntgen�s Third Symphony and the Röntgen is clearly the superior. Whether it is the hall or a matter of microphone placement or both I do not know but the acoustic factor casts an unwelcome shroud over the fortissimo passages. I heard this played in its standard CD mode not as an SACD.